The Federal Energy Regulatory Commission (FERC) says that 70% of new electricity generation capacity placed into service in the first six months of 2015 came from renewables. That information is contained in a report called the Energy Infrastructure Update prepared by the Office of Energy Projects. However, it leaves out rooftop solar. 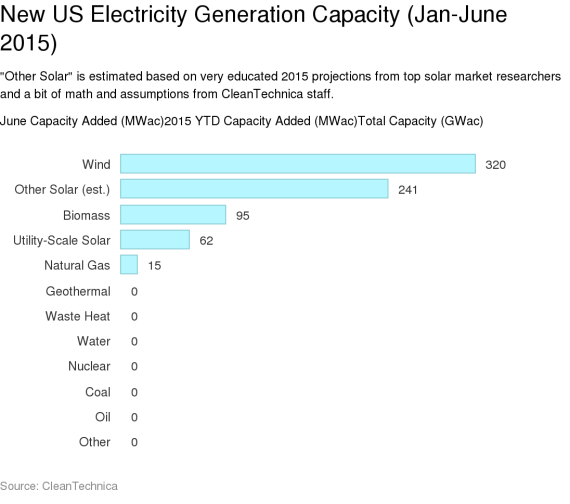 Sister site CleanTechnica adds in an educated estimate for rooftop solar and comes to the conclusion that 78.4% came from renewables from January through June. Furthermore, 98% of new capacity added in June came from renewables. The report says wind accounted for 44% of all new capacity in the first half of 2015, with 1,969 megawatts (MW) derived from 18 generating “units.” The estimate for rooftop solar came in seconds, accounting for 33% from its 1,591 MW. Utility-scale solar followed with 549 MW (71 units), biomass with 128 MW (7 units), geothermal steam with 45 MW (1 unit), and hydropower with 21 MW (1 unit). 21 new natural gas facilities contributed 1,173 MW and 1 new coal facility provided just 3 MW of new generating capacity (presumably, it was simply an upgrade at an existing plant). For the first half of 2015, new generating capacity from renewable energy sources was 1,434 times greater than that from coal and more than triple that from natural gas. So far this year, no new capacity has come from either nuclear or oil. For the month of June, wind added 320 MW, biomass added 95 MW, utility-scale solar added 62 MW, and rooftop solar added an estimated 241 MW. Natural gas brought 15 MW online in June. Renewable electrical capacity (18%) is now greater than that of nuclear (9.20%) and oil (3.87%) combined. In fact, the installed capacity of wind power alone (5.8%) has now surpassed that of oil. Generating capacity from coal has declined from 28.96% in mid-2013 to 26.6% today. What incentives the federal government will offer after the current energy credit program expires on December 31, 2016, will be decided by the next Congress. To date, the Republican majority and their Tea Party colleagues seem disinclined to fund any environmental initiatives, although their checkbooks remain open for defense spending anywhere and anytime. Voters in November 2016 will have an historic opportunity to shape the nation’s future energy policies. Will they use that power wisely or simply vote for the candidates that spend the most money, as they usually do?